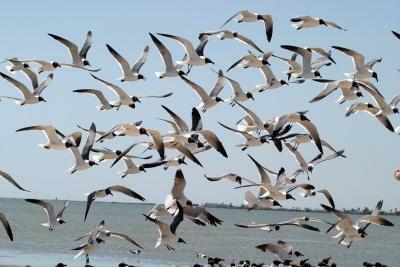 Discover the bonanza of the migratory flyway of Rockport-Fulton! 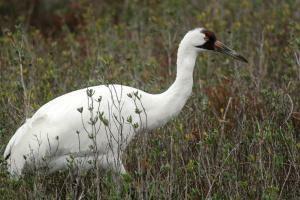 Scheduled boat trips to the Aransas Wildlife Refuge run throughout the Whooping Cranes' migratory stay. Between Thanksgiving and Christmas Rockport-Fulton enjoys glorious weather, excellent birding, and small crowds. Early in the season there are plenty of wolfberries and blue crabs for the whoopers to eat. Things get exciting because all of the families are sparring to sort out their territories as the rest of the flock arrives. The juveniles have a lot of color and are fun to watch as they still rely heavily on their parents to feed them. The Fennessey Ranch, representing over 4,000 acres of the extremely diverse habitat that make up the Texas Coastal Bend, offers tours to take you on half day and full day tours. The ranch is located on geographic borders that act as “traps” for various species. The combination of a coastal trip and one or more inland trips will allow you to experience the full potential of our area in the shortest amount of time. Aransas Pathways Birding Sites: Castro Premier Birding Site, Ivy Lane, Tule Creek East & West, Holiday Beach Pond and so much more can be found by clicking on this link. Spring: Spectacular! 200 species a day. The varied habitats in the area attract many birds, particularly during migration. 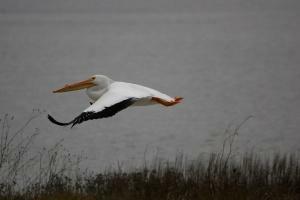 Summer: 100 nesting species in the Texas Coastal Bend. Nearby coastal barrier islands host colonial nesting birds which may be viewed from birding tour boats in the area. Fall: Spectacular raptor flights -- Merlins Swainson's, Broadwings, and Peregrines to name a few. 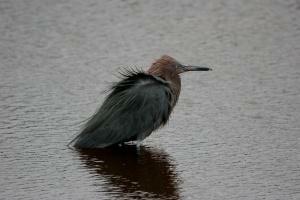 Shorebirds flood the marshes and estuaries; hummingbirds buzz the feeders during mid-September. Sometimes 200 birds in one backyard. Winter: Over 100 species might be seen on a winter's day. Winter residents, lingering migrants, southern vagrants and permanent residents make exciting birding! Nature Trail: A 19-stop walking trail highlighting birds, plants, and various subjects dealing with nature. Great for school groups. Eight-tenths of a mile long. Starts at Demo Bird Garden and loops around back to the cemetery and then to the end at Fulton Beach Road. 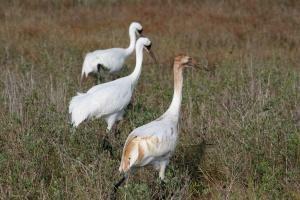 Aransas National Wildlife Refuge: 70,000 acre sanctuary on Blackjack Peninsula, winter home of the Whooping Cranes, but also over 374 species during the year. Home to over 1,000 species of plants. (361) 286-3559. 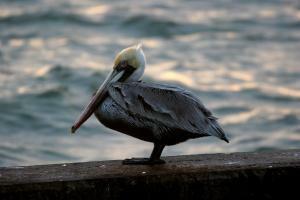 Goose Island State Park: Located just 12 miles north of Rockport on the shores of Aransas and St. Charles Bay, this State Park is great for an outdoor camping and birding adventure. See waterfowl, shorebirds, and passerines. (361) 729-2858. Fennessey Ranch: The Fennessey Ranch is part of a legendary 750,000 acre Texas land empire that has remained in the same family for 171 years. The ranch consists of 4,000 acres of abundant wetlands, meadows, natural lakes, riparian woods and brush land and bordered on three sides by the Mission River. The Fennessey is located in the heart of the Central Flyway along a region of the Texas coastline known as the "Coastal Bend." 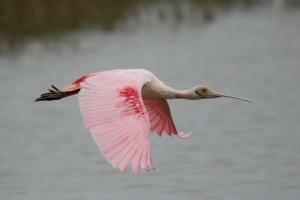 World Class Birding, Field Trips, Customized Tours, and more are available at 361-529-6600. Connie Hagar Cottage Sanctuary: As a memorial to Connie Hagar, the Friends of Connie Hagar, Inc., purchased the Hagar property in December of 1994 to establish a bird sanctuary and historical site. Wooded inland birding site. 6.25 acres of trails. Rockport Beach Park: Bird Sanctuary on West side of beach area. 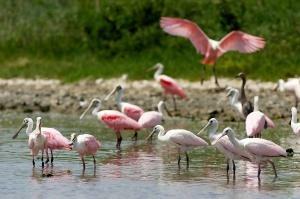 Islands host Rosette Spoonbills, Blue Herons, Egrets and more. Demo Bird Garden and Wetland's Pond: Texas Department of Transportation Rest Area. A garden and pond demonstrating native plants that attract birds, waterfowl, and wildlife.